The gingerbread creations must be original designs and can have a theme. “The goal for each baker is to produce a house that has selling power,” Ostrander says. The completed houses are auctioned for sale, with all proceeds going to Children’s Hospital of The King’s Daughters. “It’s amazing to see students create with their hands what they see in their minds,” Ostrander says. Jessica Willis’ gingerbread house was reflective of a baking tradition she shares with her grandmother. Her entry has cornflake, marshmallow and butter treats shaped into green bushes – a homemade treat that is a favorite of her grandmother’s. The same concoction serves as wreaths on the front doors, with dried cranberries as bows. Colorful nerds double as holiday lights, peanut brittle line the walkway and a snowman, with a Tootsie Roll hat, stands in the yard. “This has been the most fun I’ve ever had in this class,” Willis says. Brian Cuison’s house is modeled after the original Sugar Plum Bakery in Virginia Beach. Outside the house are little boys in a snowball fight, using mini marshmallows as fire power. Inside, cupcake confections surround a tree. “I worked at the bakery for a short time and wanted to pay tribute to what I learned there,” Cuison says. 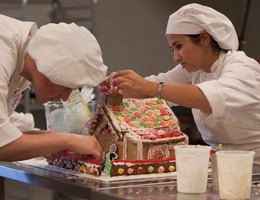 Do you want to take a peek at TCC’s yummy gingerbread village? The baked masterpieces will be on display in the Culinary Arts program dining room Monday, Dec. 17 through Wednesday, Dec. 19.